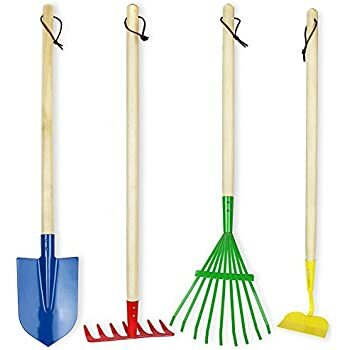 4 piece large "real life size" gardening tools for kids for outdoor play made of durable solid wood and metal. Set includes; 1 Rake, 1 Leaf Rake, 1 Shovel, 1 Hoe, each tool measures approx. 27.5 inches long. A leather loop at the end of each tool allows it to be hung vertically for storage. Handles are made of solid wood, heads are made of real metal. We got these tools for our son for Easter and immediately had to repair them because the screws had come loose. 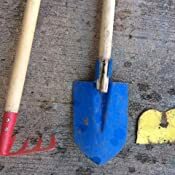 Within a month, the head of the hoe had completely broken off and all of the other tools are bent. Our kids always want to help in the garden. These are great for both our 2 & 4 year old (both tall for their ages). If they play too rough with them the metal can get misshapen. $20 was worth keeping them from "borrowing" my tools. 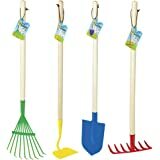 I haven't been able to find gardening tools like this for less than that price. Made of wood and metal. We bought these for our three year old. They are very much real tools, just smaller versions. The metal spade and sharp metal rakes really aren't appropriate for kids too young. They were dangerous and sharp for a little guy who isn't always paying attention to the way he's holding them. I'd say this is a good idea for slightly older children. Also, the wooden handles were splintered on one of the tools and needed to be sanded. 5.0 out of 5 starsWheelchair bound. 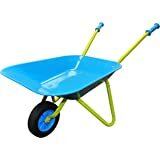 Perfect length & weight to keep on gardening! I am disabled & in a wheelchair. Regular adult tools to work in my garden, raised planters, were either too short or too long & too heavy. 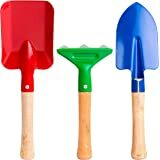 Your children's garden tools are perfect. Not a plastic fun toy. With the real metal working surfaces I can reach the back of my planters 6 feet away with ease. I planted collard greens this morning & weeded around my rose bushes (in the ground) with the hoe and the hard rake. You should look at marketing these to people stuck in wheelchairs (or have other mobility issues). They are a godsend for me. 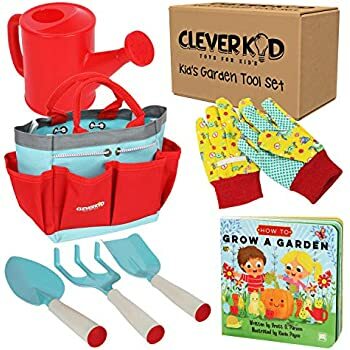 High quality tools for little kids. My two year old wants so much to be a "worker guy". 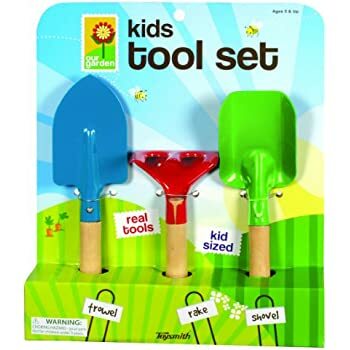 These fit the need for pint size tools that will stand up to his imagination. They are metal tools with wood handles. After a few months they are still well attached. The leaf rake stays at great grandmother's house so he can join the rest of the work crew. The others are in his dirt pile in the yard and take more abuse. They are holding up just fine. 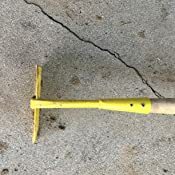 Plus, the rake can double as a microphone. 5.0 out of 5 starsHighly Recommend! 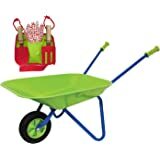 Fun and Durable! 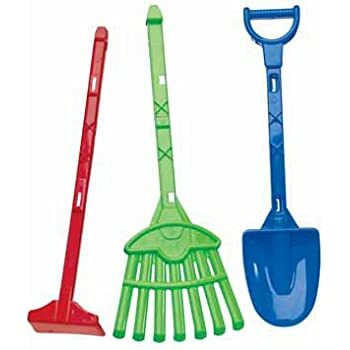 My now 6 year old son got these as a 2 year old and has played with them digging and "doing yard work" in our yard constantly ever since. We also have a 2 1/2 year old son that loves them just as much. They held up remarkably well for all the abuse they took, especially considering their affordability. Back to get a replacement set after 4 years because two of the pieces finally gave out. 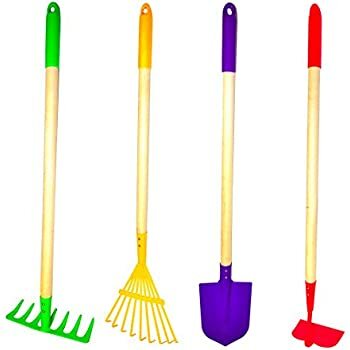 I bought these for my boys ages 8, 5, 3.5 to play in the dirt outside. They looked great when they arrived. 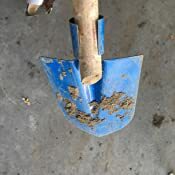 However after playing/digging in the dirt only half a dozen times 2 of the 4 tools are falling apart. The screws holding the metal to the wood handle have come out and are no longer clamped around the wood handle like they should be. Disappointed. 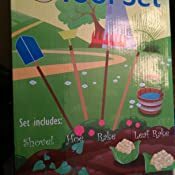 This toolset for kids to do yardwork is so much fun. 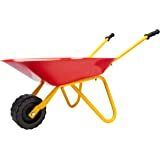 The items are really well-made and very sturdy. They are meant to be used for kids between the ages of 2 to 7. My nephew loves to rake stuff up and use the shovel to put it in his wagon. Your kids will have lots of fun with this product! 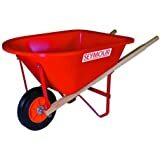 If you decide to use this outside I recommend that you put a clear coat on the wood to help keep it from falling apart. Not a necessity but it's just one of those things where kids tend to leave things outside. Lol ! But your kids will have lots of fun with them!